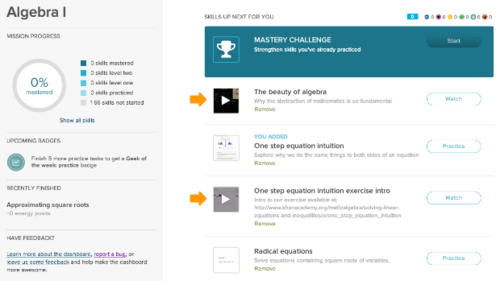 Khan Academy is now introducing video tasks on the learning dashboard. Prior to this release, the mission dashboard consisted exclusively of practice and mastery tasks–problems to practice and interact with the skills. If a student didn’t know how to do a particular exercise, they would have to rely on the video in the specific skill or manually look up the video, and there was no way to know ahead of time which videos are particularly useful and which aren’t. With this in mind, we decided to research which videos on our site are most effective in helping people learn. We then wanted to explore how we could make sure students see these videos when trying to learn related skills. Many of our exercises are tagged with “curated related videos”—videos that are hand-selected as related to the exercise. Using this as a starting point, we looked at all the videos that were already tagged as related to any exercise. For each of these videos, we compared the accuracy on its associated exercise both before watching the video and after watching it. From there, we selected the top fifty most effective videos, each improving the accuracy on its associated exercise by at least twenty percent, and are now highlighting them on the mission dashboard. When the system recommends an exercise with an associated video on the list of our top fifty related videos, it will automatically recommend the related video as well. Similarly, when an exercise with an associated video task is manually added to a student’s list of exercises as a personal task, the video task will also be added automatically. A student might watch the video before attempting the exercise, which is why we place the video tasks immediately above its associated exercise. Alternatively, a student may want to attempt the exercise first, and if they struggle with the exercise then they can close it out temporarily and watch the video before trying again. If a student doesn’t need to watch the video, the video task can disappear in three ways. If the student watches the video, the video task will never reappear for that student. The student can also remove the video task without watching it and it will never again be shown to them. Finally, if the student completes the associated exercise and renavigates to the mission dashboard (refreshing the page, e.g. ), the video task will also go away. However, in this last scenario, if the exercise ever reappears on the mission dashboard of this student, the video task will also return. We sincerely hope you find this update as exciting and useful as we do!